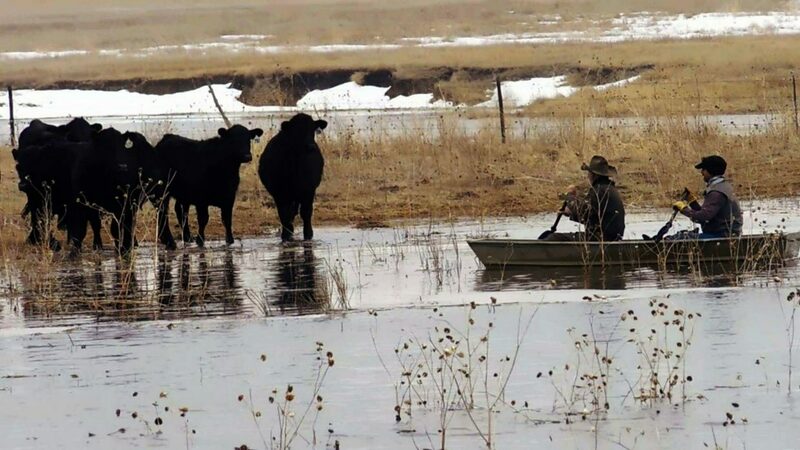 Two men and two calves in a boat during a flood rescue. 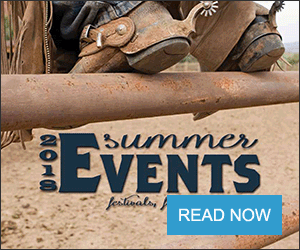 In 2018 and 2019 U.S. farmers and ranchers nationwide weathered several major disasters including wildfires, a volcanic eruption, two Category 4 hurricanes, an earthquake, tornadoes and major flooding. While the direct financial estimates of the damage — which include several factors, such as infrastructure damage, supply chain disruption and business interruption, as well as the loss of crops and livestock — are still being compiled, it is possible to assess the economic contribution of agriculture in the regions most affected by these natural disasters. 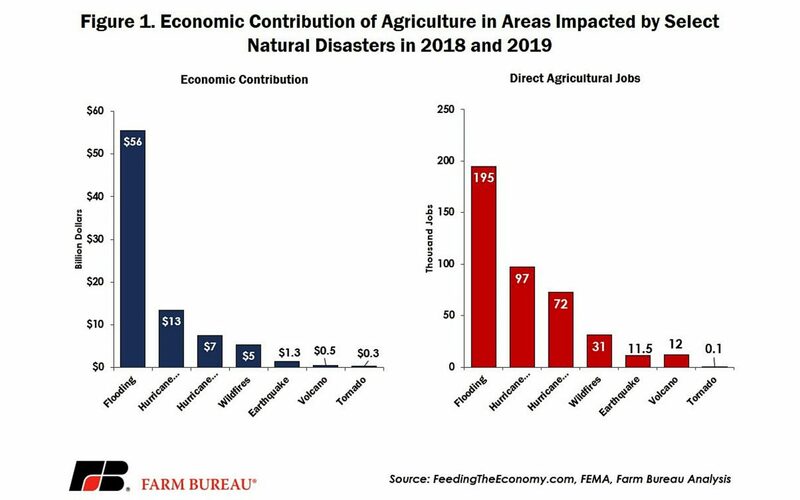 The total economic contribution of agriculture in congressional districts in which major natural disasters occurred in 2018 and 2019 is estimated at $83.8 billion and encompasses 419,000 direct agriculture-related jobs. 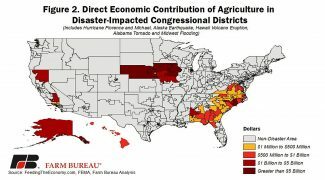 These economic contributions include all monetary market transactions and jobs directly related to farming in congressional districts that contain a county with a FEMA-declared natural disaster. The FEMA disasters included for this analysis are: the wildfires in California, the volcanic eruption in Hawaii, Hurricanes Florence and Michael, the earthquake in Alaska, the recent tornado outbreak in Lee County, Alabama, and the devastating flooding in the Midwest last month. An economic contribution analysis was not available for Puerto Rico and so the impact of natural disasters on their agricultural economy was not included in these totals. The economic contribution of agriculture was the highest in flood-related disaster areas at $56 billion and 195,000 direct jobs. Following the flooding, the area struck by Hurricane Florence came in at $13 billion and 97,000 direct jobs. Hurricane Michael, and the tropical storm it was eventually downgraded to, did damage in areas representing $7 billion in agricultural economic contributions and 72,000 jobs. The areas impacted by the California wildfires represented $5 billion in agricultural economic contributions and 31,000 jobs. In Alaska, which suffered from an earthquake in late 2018, agriculture contributes $1.3 billion in economic output and represents 12,000 jobs. In Hawaii, where agriculture across the islands represents an economic contribution of $523 million and nearly 12,000 jobs, the Big Island's Kilauea volcano erupted in 2018. Finally, in Lee County, Alabama, agriculture's economic contribution represented $284 million and nearly 100 jobs. Figure 1 highlights the economic contribution of agriculture by natural disaster classification. For disaster-impacted regions, the direct agricultural economic contribution was the highest in Nebraska's third Congressional District at $15.7 billion, followed by Iowa's fourth Congressional District at $13.2 billion and Nebraska's first Congressional District at $6.8 billion. Overall, 65 congressional districts included a FEMA-designated disaster county in 2018 or 2019 associated with the wildfires, hurricanes, tornados, floods, earthquake or volcanic eruption. Figure 2 identifies agriculture's direct economic contribution by congressional district. Similar to the economic contributions, direct agricultural jobs were the highest in Nebraska's third District at nearly 47,000 jobs. Following Nebraska's third District was Iowa's fourth District with nearly 45,000 jobs. Missouri's sixth District contained more than 37,000 direct agricultural jobs. 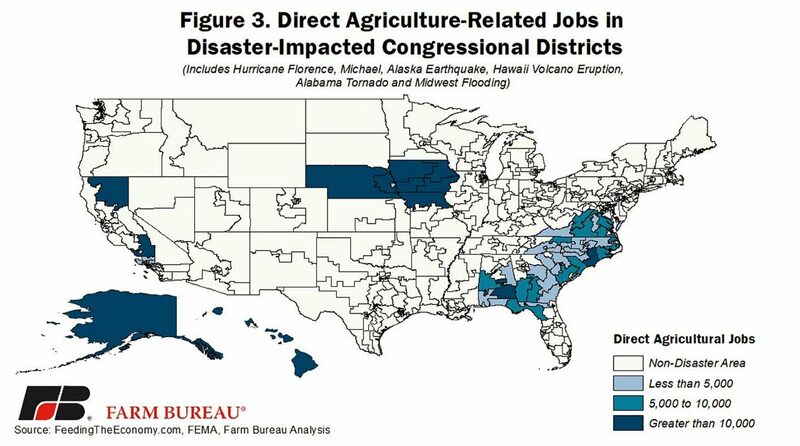 Figure 3 identifies direct agriculture-related jobs in disaster-impacted congressional districts. 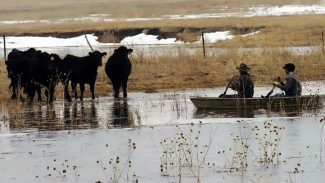 Livestock producers may be able to use USDA's Livestock Indemnity Program to receive financial support for lost or injured livestock, but the assistance is limited to 75 percent of the market value. 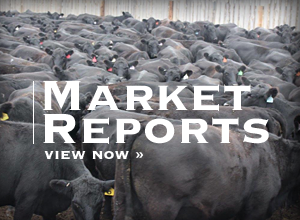 While crop insurance is available for some of the commodities damaged by natural disasters, it is revenue-based insurance and does not cover the financial losses associated with harvested commodities damaged or lost while in storage. Additionally, crop insurance does not cover the future financial losses associated with a downed orchard. For crops not covered by crop insurance, USDA's Noninsured Crop Disaster Assistance Program may provide some financial assistance.